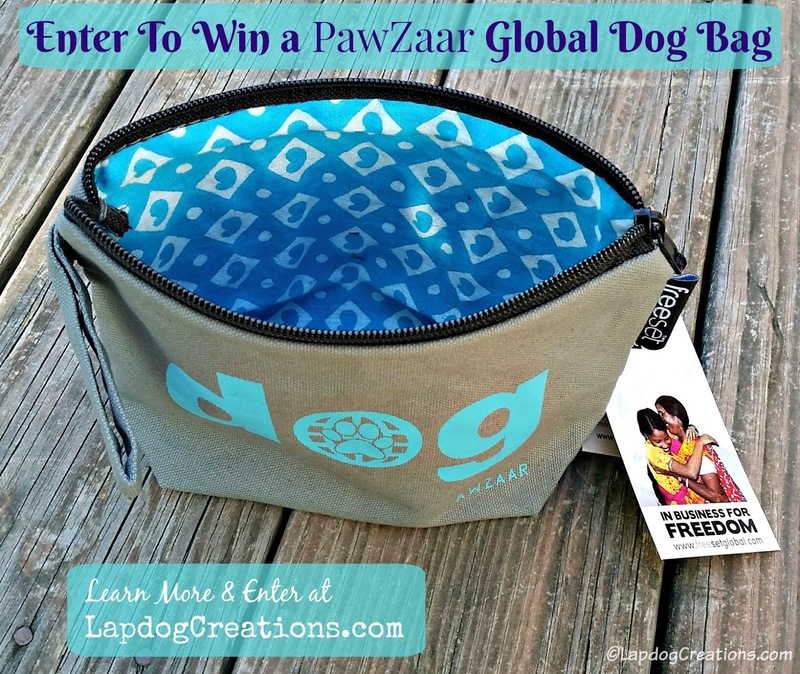 Disclosure: PawZaar sent a Global Dog Bag to Lapdog Creations, free of charge, for review purposes. Lapdog Creations only shares information we feel is relevant to our readers, and all opinions expressed are my own. PawZaar is responsible for the giveaway prize. This post contains affiliate links. If you click on one and make a purchase, I may receive a few pennies to assist in maintaining this blog. You may recall we shared some of our favorite items from Pawzaar with you earlier this year. Needless to say, I have been a huge supporter of them ever since! 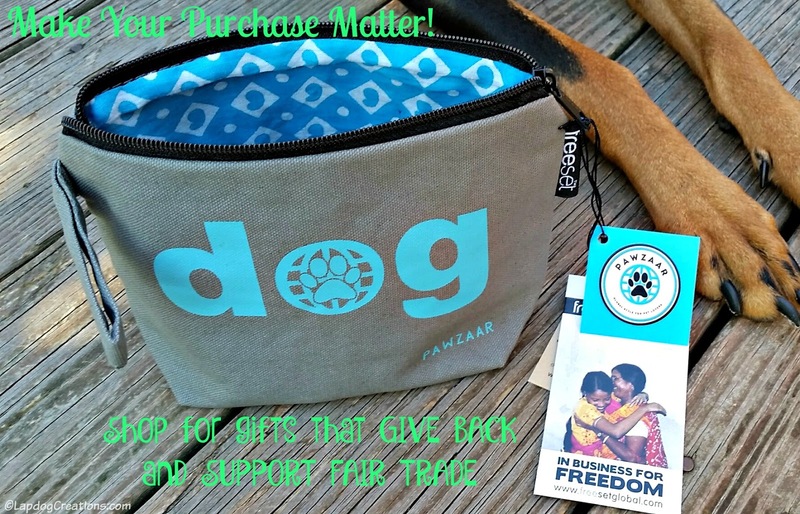 After all, who can resist a company that offers pet-related items that are handcrafted by global artisans - and gives back? I made no secret of the fact that the RESCUE Tote Bag is one of my most favorite items ever. It's versatile, stylish, roomy, and best of all, shows off my love of all things rescue. So when I heard PawZaar added a new little bag to their line, I had to have one. The Global DOG Bag is just as stylish as the large RESCUE tote, but due to it's smaller size, it's even more versatile. 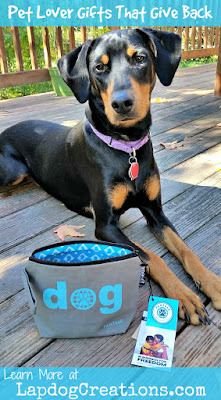 The organic cotton bag features the blue global dog logo screen printed on both sides using water-based, eco-friendly inks, and is lined with a recycled sari fabric lining (just like the RESCUE tote). The uses for the Global DOG Bag are pretty much endless. It's the perfect size for your wallet and keys while running errands, or for your dog's treats, poop bags and essentials while out for a hike. You could use it as a make-up or toiletry bag, while at dog shows, to hold school or art supplies, to pack small items when traveling... the list of uses goes on and on. Each Global DOG Bag is handmade by a fair trade cooperative in India that rescues women from trafficking situations. When you purchase it, you're not only helping homeless animals, you're helping women better their lives. Now that's a purchase you can feel good about making! 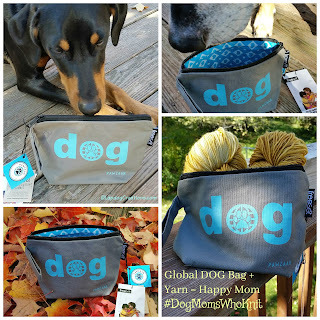 The Global DOG Bag makes the perfect gift for your dog sitter/walker/groomer, friends, and family. If you want to make it extra special, stuff it with treats, for the human or dog. PawZaar has some fabulous jewelry pieces that would fit nicely inside. 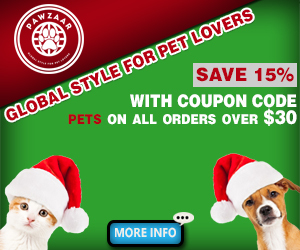 The holidays are quickly approaching and PawZaar is the perfect place to shop for your pet-loving friends! Not only will you find unique items, but you'll be helping to give back to animals in need and supporting fair trade cooperatives around the globe. The awesome folks over at PawZaar are letting us give away a Global DOG Bag to one (1) lucky winner! PawZaar is incredible! What didn't catch my eye? After visiting, I realized that I actually have stuff from here already! I really liked the cookie cutters. Perfect for the holiday baking season. You can never have too many bags...and one that's dog-centric wins paws down! What cute bags! I love that htey help women in trafficking situations and animals! What a cute bag! I love that they help animals and women in trafficking situations get back on their feet! Sweet! I travel a lot and just adore bags. This is super cute. I'll have to check it out. Love the bag and the fact that they help rescue women and pets. What a great company. Will have to check out more of their products and include in Christmas lists. I am such a sucker for bags! I love their Rescue bag, too! Too cute! I love it. Their products are so fun. That's a great design - you can never have too many bags! Love the bag! Somehow you can never have enough dog supplies can you? I do try and support ethical companies, those that produce products not tested on animals and anyone who does something to give back to the community. This company seems to fit the bill! I love all of it, but especially the bags and the 'Live Love Adopt' bracelet and necklace from Taxco, Mexico. So many great gift ideas! Can't enter but cute stuff. I like this company too. What a great company, giving back to both animals & people. Especially trafficking, there is very little more sickening than human trafficking. This bag is beautiful! I liked their jewelry too, so pretty. I like everything, but I really like this global bag - I agree that they would make great "rescue" bags! How cute! I need a new make-up bag in the worst way. And having one that is dog related would be great! I've never heard of this company before, but it sounds like a great one! I really like the scarf as well the bag you featured. Ah darn it we are Canadian! ah well ... I shall go look at their site. I do like the look of that tote bag! I love Pawzaar! The bowl looks pretty cool. We just lost one of Ruby's traveling canvas bowls so maybe we will check this one out. I do like the Dog Cookie Cutter Collection. These would be perfect for biscuits for pooches! The Dog Cookie Cutter Collection are very cute. Would be perfect for adorable doggie treats. Choosing is torture. You know how much I love bags of all varieties, but I love jewelry even more. There were so many I liked but the Forever In My Heart charm was special. All my pups are forever in my heart. Absolutely LOVE the Pawzaar dog bag - it looks very well constructed and just the right size for all of our needs! Great bag! Love that they give back, too! I definitely need to check into this company. I love pet-themed items. I love that they donate a percentage to rescues! I have so much trouble getting all my stuff in my treat bag when I drive the dogs to the park quickly and I hate bringing my purse as I don't like leaving it in my car when I'm out... great product, thank you for the head's up. I visited the site and love that they help women. I also love the treat bag and would carry little items for the dog in it. Super fun contest. I like the lining. It's so bright and cheery! What a cute bag and it has so many possible uses! Well done to the company for being so conscience and helping others. That bag really is seriously pretty and the company sounds terrific. Thanks for joining the Thankful Thursday Blog Hop! i love all the cookie cutters! would be great to make puppy shaped treats for the puppies! Such a cute bag! I also love the Live Love Adopt Necklace from Taxco, Mexico. My eye was most caught by the Always In My Heart Charm. I love pawzaar! The cookie cutters are the cutest! The cookie cutters! It's so hard to find great ones for treats. So many pretty things on their site. The paw with wings pendant made me smile.